David Moyes took over a team that badly needed new signings almost all around the pitch. 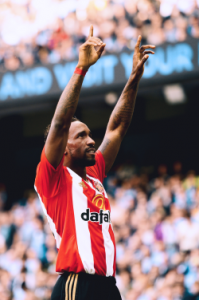 Only Jermaine Defoe and Patrick van Aanholt thoroughly deserve to be retained from the previous season. Signings were not done until last days of the transfer window, when a few players were brought in – Adnan Januzaj on loan from Manchester United being the notable one. Their first game at Manchester City was a well fought battle, but they came short at the very end conceding the 3 points to City after an own goal. Their next two games did not yield 3 points either. One would think after several years of this same of start in the league, Sunderland would at least have learnt the importance of having a good start. The following 3 games have yielded not more than 2 points in total. It’s becoming a familiar terrain for Sunderland to come short at the end of games – it’s either they are conceding late equalizers or failing to nick the game with vital chances created. Fans became furious after Moyes acknowledged that they may well be in for another relegation battle after the loss to Middlesbrough. This may be true judging by the similarities in the results they have so far had and those of the previous seasons. Burnley bounced back to the Premier League with the same manager they went down with in Sean Dyche. 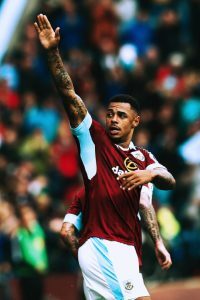 A win against Liverpool at Turf Moor was the much needed motivation they needed to take on into the season, but a 3-0 loss at Stamford Bridge soon followed and that sent back the warning signs that a lot more work is still needed to be done to avoid the drop. The win against Liverpool was well executed, albeit Liverpool being classless throughout that match. 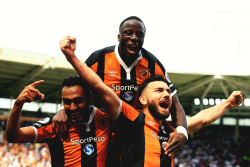 The point got from the following game against Hull City calmed a bit of nerves – some lessons were learnt from their 3-0 drubbing against Chelsea. Another 3-0 drubbing quickly followed against the defending champions, Leicester City, proving fragility of the team. 7 points from 7 games may seem fair in the mix of teams currently below them in the table, but big, big games await them in the coming days and only how they hold out in those coming games would confirm if Burnley are not set for an immediate drop back into the 2nd tier of English football. The Tigers were penned down for an immediate drop from the Premier league when their erstwhile manager, Steve Bruce resigned his position just weeks before the start of the campaign. But the caretaker manager, another prodigy of the school of Sir Alex Ferguson at Old Trafford has been able to give some ray of hope. Winning their first two games and just losing the third one to the Red Devils only at the last minute after some dogged compact play. The win against Leicester City, the current champions was indeed a big surprise, which was followed with another solid 3points display at Swansea’s Liberty Stadium. Much is to be made of who takes stewardship of the team on a permanent basis. In fairness, their last three games against Chelsea, Liverpool and Arsenal might have been too much to ask of them after the spoils were share with Burnley. If Mike Phelan is allowed to continue, then HULL may be lucky to avoid the relegation fight. The jury is still out. Penning down Potters in this list surely sounds as a surprise, but something drastic has to be done. The balance of the team has been called into question despite the addition of players over the summer. The arrival of the likes Bruno Martins Indi has not stopped the team from shipping in 4 goals in a single match, something that became a constant occurrence towards the end of last season. 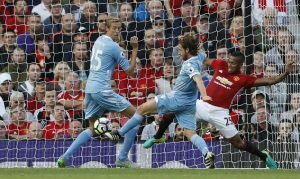 If they are to match the heroics of last season, then Mark Hughes must find a solid balance for the team especially in defence and maybe the point they stole from Old Trafford from their last time out may be the turning point. The Swans are the first team to change managers this season, this is understandable after a below par performance so far. The management at Liberty Stadium may be wary – to not allow just an escape from relegation as it happened last season, but with the appointment of Bob Bradley with no experience in English football, a gamble has been taken. Having had no adequate replacement made to the loss of club captain in Ashley Williams to Everton, they were always going to be exposed. Bradley’s appointment comes with a lot of goodwill, largely due to his vast experience and having had his teams play pragmatic football with compactness in midfield. Their next game at the Emirates would put these qualities to test – and if they can come out of that with any positive result, they might just be able to start turning things around. Aitor Karanka’s side has a lot of similarities with his compatriot’s (Roberto Martinez) Wigan’s side. Good football – a lot of time promising, but not very result oriented. Boro started brightly before quickly coming back to earth. With their enterprising midfield to forward line comprising the likes of Gaston Ramirez, David Nugent, Alvaro Negredo and the vast experience of Stewart Downing, they should be turning more of the draw results to wins. A point got from a possible 9 at the Riverside stadium doesn’t bode well, things must be turned around the sooner to avoid scrambling for their lives come the 2nd part of the campaign. This list may not be complete for some without the mention of AFC BOURNEMOUTH and very surprisingly WESTHAM UNITED. The latter find themselves in the relegation places largely due to very embarrassing performances so far, especially from their backline. They have not been able to conjure the amazing performances that saw them close the Bolelyn Ground on a high against Manchester United last term. One would expect that things would turn around quickly – it has to. 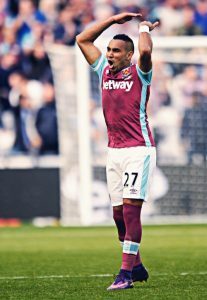 Dimitri Payet is showing he might just be their saviour from the embarrassment this season, with that wonderful solo goal against Middlesbrough on match day 7, to avoid yet another defeat at their new home ground, the Olympic Stadium. Michail Antonio has also been consistent scoring headed goals, 5 so far; Slaven Bilic has a lot of work to do to return them to the heroics of last season. AFC Bournemouth stayed out comfortably of the relegation zone last season and one would expect them to stay afloat again come the end of this season. Their very impressive win against one of the promising sides so far, Everton was a good one. It really showed the Cherries have the experience to hold their own and grind out results when called upon. It is always not going to be rosy, but the crop of young talent at their disposal should make Eddie Howe steer another Premier League status at the end of the season.